To say that nothing happened in Because Me would be a little harsh. But finding all the checkpoints of the dramatic structure within the text is quite difficult. Written and directed by Max Baker, Because Me, presented by Stable Cable Lab Co, is an examination of the life of a twenty something struggling artist. Because Me follows Else, a white girl, as she moves into a decaying apartment building where she becomes a minority. Through a series of scenes that chronicle her nine months in the apartment, we see her and her pals interact despite feeling alone, depressed, and struggling with life. With six supporting characters that add little to a story, Because Me struggles to find itself, much like the focal character. There surely is a point to Baker's story. But it takes an architectural dig to find it. In every scene, we watch Else battle life as her companions seem to have other cares. So is the thesis that we live in a world where we can't focus on ourselves because we tend to worry about others first? Maybe. Or is it that we're all so wrapped up in ourselves that we can't see the pain in others? Perhaps. But dramatically, it was horribly uninteresting to watch. Baker's script is filled with so much lack of explanation. From Else randomly appearing wearing a neck brace to the kleptomaniac neighbor Kyle to really who these characters are. It's as if you're watching "Lost". All set up, no answers. The big question you must ask is what do all these moments have to do with the overall arc of the play and Else's character. The most climatic moment came when Else's computer is stolen. How this isn't the end of the world for Else is quite shocking. Between it first being gone, an enormous expense to be paid, and the fact that someone broke into the apartment and stole it, the way the character handled the situation was simply unbelievable. Structurally, many of the scenes felt incomplete, leaving on awkward buttons. As far as the timeline of the piece is concerned, we're told it is a span of nine months but Baker says Else is 28 early on only to have her say it's a week before she turns 30 at the end. It's a simple switch but it's these moments that prove that with Baker playing writer and director, there are immense problems. Playing depressed and dejected is not an active action to play on stage. Alice Johnson as Else was set up to fail. Due to the nature of the character there was no way to give Else life. You could see Johnson wanting to do something but it would stray from Baker's intent and text. With nothing interesting to play, appearing committed to the story was hard. There is a character study to be explored but perhaps the stage is not the place for it. Roman is a lively, energetic character but his dialogue is so soap boxy. Thankfully, Arthur Kriklivy's high energy sold it. Sadly, spewing personal opinions seemed to be his only purpose in this piece. As self-centered sister Celia, Samantha Strelitz created a character that was beyond recognizable. 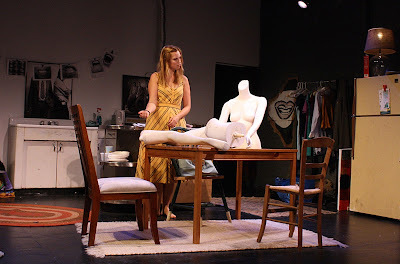 Though she only seemed to care about herself in the moment, the scene between Celia and Else post potential breakup was the strongest of the entire play. There was actual substance within. Keeping with the self-centered characters Even Marie Mugar's Mimi is the millennial we all hate. She created her with great ease. She got under your skin with every ignorant comment and ability to use anyone in her path. So she was successful in that regard. Neighbor Kyle was by far the most interesting element that Baker needed to explore. Emmanuel Elpenord offered all he could to leave you wanting more. But with that crucial character moment that never gets explained, you're left wondering why he's really necessary. It was clear that Because Me made sense to Baker and only Baker. By directing his own work, what was on the page did not translate to the stage. Baker was in desperate need of a collaborator to fix the problems. With the play exploring a nine-month time frame, scenic designer Doss Freel created an apartment in transition. Freel's mishmash of items seemed to fit Else's style though not seeming like it was actually suitable for living. Though there were discrepancies between text and design, it didn't cause much issue. The way Freel and Baker laid out the space was very much in line with the square of the stage with the sole exception of the angled table. Being the singular item that was not in grid formation threw it all off. Because Me was problematic from start to finish. It's possible that Because Me was not ready for this level of production.